August Ragone, author of the must-have book "Eiji Tsuburaya: Master of Monsters" (available on Amazon) has some great news. On his blog, "The Good, The Bad, and Godzilla," Mr. Ragone confirmed the release of double feature DVD sets coming May 6th 2014. The titles have already been listed on Amazon.com by Sony Pictures Home Entertainment. Below is the list of the four double features with links to Amazon. 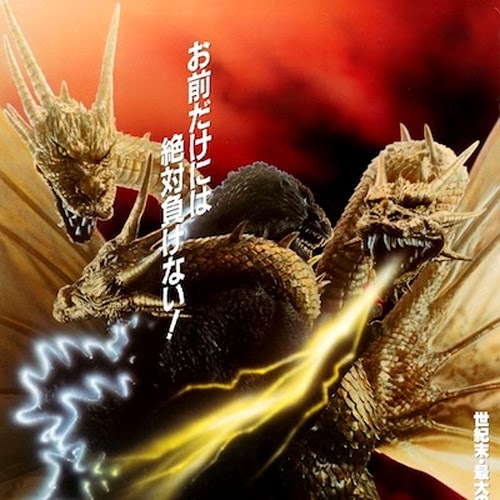 August Ragone notes, "Conspicuously missing are GODZILLA 2000 (1999), GIANT MONSTERS ALL-OUT ATTACK (2001), and GODZILLA AGAINST MECHAGODZILLA (2002). It's unknown at this time if these will follow — I'll keep checking on sources..."
Thanks for the heads-up August Ragone! August Ragone was born in San Francisco and is the Rondo Award winning author of the highly regarded "Eiji Tsuburaya: Master of Monsters" (Chronicle Books, 2007). August has commented on Japanese film and popular culture on radio, television, in print, online, and at events for more than three decades. While still a teen, he served as "Japanese Film" & "Godzilla Expert" for legendary horror host Bob Wilkins at KTVU TV-2. From his experience living in Tokyo and meeting Japanese filmmakers, August has written liner notes for numerous DVD releases, edited and authored over 100 subtitle scripts (so far), and has also contributed to periodicals such as the Japanese Fantasy Film Journal, Filmfax, Video Watchdog, Asian Cult Cinema, Henshin! Online, Oriental Cinema, G-Fan, Super7, Otaku USA, Monster Attack Team, and Famous Monsters of Filmland. The Baghdad-by-the-Bay native has also been an event promoter, starting with the "Japanese Fantasy Film Faire" (1979), the first Anime event held outside of Japan, as well as producing live music and multi-media events including The Sleazefest, Incredibly Strange Wrestling, The Greaseball, Godzillafest, and Shock It To Me!. Thanks, Guy! It's appreciated — cheers! Stunning post with information. I was also excited to here this releasing news. Do you need to share this DVD with your family or friends or need more copy of this film then try CD & DVD Duplication service. If you're seeking a light-weight instance to deliver every one of your baggage, the IT Travel suitcase-- from IT Travel luggage Globe-- may simply hold true for you (least expensive cost right here!). This item uses lots of flexibility as well as some style function's that make any type of journey a lot more less complicated because of this. Allow's take a better consider just what this situation needs to use. This instance can be found in 4 various dimensions however, for the function of this evaluation, we are checking out the extra-large choice. Also though it has a capability of 106 litres, its weight is instead excellent. 2.6 kg is not hard to bring as well as it includes extremely little to the weight of your travel luggage. This is essential, taking into consideration exactly how a lot this instance could in fact fit. With a 106 litre storage space ability, there's not a problem saving your products within. It has a dimensional dimension of 86 x 49 x 28 centimeters, which makes it a sensible dimension to bring about. At 2.6 kg, this is an instead light-weight layout, particularly considering its dimension, which is a huge advantage. Extra storage space areas at the front. The 4 rewriter wheels-- in addition to the stretchable manage-- make manoeuvrability an easy job. The luggage likewise is available in a variety of brilliant, fluorescent colours. There's no worry locating this instance on a huge slide carousel. 2.6 kg is not hard to bring and also it includes really little to the weight of your baggage. This is important, thinking about exactly how a lot this instance could really fit.